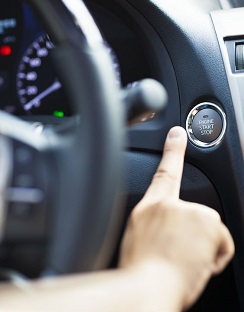 Keyless ignition, or keyless entry, cars (where you only need to have the key in the car rather than having to turn it in an ignition) are one of life’s modern conveniences, saving you from having to dig the key out from your bag or pocket. The fobs work by emitting a unique radio signal that can be picked up by your car when the key is within range. Unfortunately, this same technology can make it vulnerable to thieves. This video has been released by West Midlands Police showing a couple of thieves using a device which amplifies the radio signal and allows the car to be unlocked without even needing to break into the house. It’s known as ‘relay crime’; one device picks up the radio signal from within the house and relays it to a second device in proximity of the car, allowing it to unlock. It can be done in around a minute and does not require them to disturb the house in any way. How can you prevent relay crime? As we’ve written about previously, many house break-ins are motivated by car theft and it’s quite usual for people to keep their car keys out of sight when they go to bed for that reason. However, few realise that they need to block the radio signal as well to keep their cars secure. Fortunately, it’s not that difficult a thing to do. Placing the key in a microwave, a fridge, a metal biscuit tin or even wrapping it in aluminium foil would probably do the trick but they’re not the most convenient places and offer thieves who DO break in, easy places to find them (plus you’re just a step away from fashioning a foil hat and locking yourself in the cupboard under the stairs). A better option would be to keep them in a shielding sleeve/box (also known as a Faraday Cage) or a security safe. Of course, a safe has the added advantage of keeping them secure should someone take the ‘old fashioned’ approach of actually breaking into the house for them. (Plus, you can keep other items such as cash and jewellery in there as well). If you would like to buy a home security safe we stock a number in our shop in Wakefield and we are official stockists for Securikey so you can browse their safes and order direct from us.